So I've super been enjoying Unbreakable Kimmy Schmidt since Netflix starting airing the show. As much as it initially struck me as a weird, oddball comedy, it grew on me really quickly. Now that we're three seasons in, I remain as hooked as ever and once again eagerly waiting for the next season to be ready someday. But seriously, this show is like some sort of a cultural phenomenon of the strangest kind given it's celebration of the old, the new, of pop culture, of rediscovering weird parts of the internet and all that fun stuff. It's borderline offensive at times but in a way that pushes the comedy and perhaps highlights the casual racism and sexism that's part and parcel of every day life. This third season certainly put effort into further growing Kimmy's character and indulging in some crazy moments just for the heck of it. But when you've survived all the way to a third season, you totally deserve to get to experiment a little more. 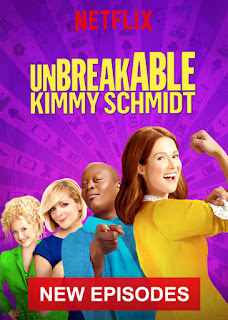 Synopsis: Unbreakable Kimmy Schmidt is an American comedy TV show created by Tina Fey and Robert Carlock. The series has received a number of nominations over the years and has already been confirmed for a fourth season. Kimmy Schmidt (Ellie Kemper) now has her G.E.D. and thus the only thing left to do is...try going college! And this becomes her major arc in this season as she tries to explore new ground and make herself better. But then she also received divorce papers from the Reverend (Jon Hamm) and she's not quite sure how to handle things as she was prepared to just not think about it him at all and yet here he was again. Meanwhile, Titus (Tituss Burgess) is back home early from his cruise for reasons unknown and in typical Titus fashion there are some colorful reasons behind his sudden departure. Lillian (Carol Kane) is oddly determined to become a member of the city council in order to stop the further gentrification of the area among other things. What I Liked: I think the Lemonade episode is pretty much the ultimate personification of how this show works. It's a pop culture celebration that is nuts and crazy but awesome and amazing and all that fun stuff. Any show could have done Beyoncé's "Hold Up" as a parody tribute and call it a day. But this show managed to cram an odd tribute to her Lemonade album as a whole while still moving the Titus narrative arc forward and still spend some time with Kimmy at college. And I was really surprised by the story arc crafted for Lillian and this whole city council run. It was easy to dismiss her as a crazy old lady who would rant about this or that thing changing in the city. But then she puts her money where her mouth is this time around and actually tries to fight for things - and oddly enough she actually takes some steps forward despite the fact that, well, she's Lillian. What Could Have Been Better: Oddly enough, I felt that Kimmy's main arc about going to college had a pretty weak start. I don't think they quite knew what they wanted to accomplish there and so the first few depictions of her time at college felt very random and unstructured. And while some may argue that a lot of the show feels this way, but it felt especially odd with this angle. Sure I enjoyed the bit about the rowing team but not much else. It found its legs later on but it took a while. I also felt Jacqueline didn't have as strong as a direction in this season. Sure in past seasons she had her absentee husband and then her divorce. But here she had a very odd relationship with odd twists that didn't feel all that creative and so things went on and on and on. Things could have been a whole lot better but then it wasn't. 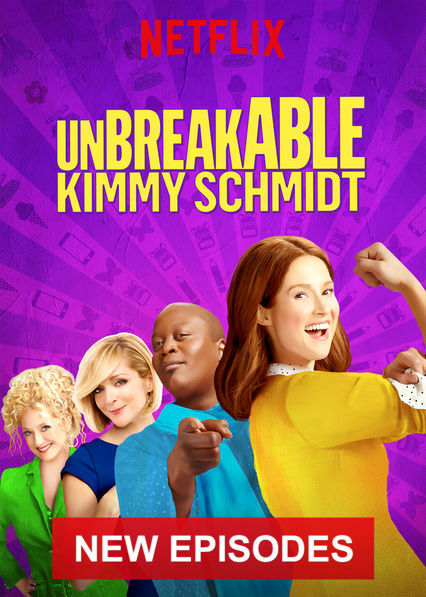 TL;DR: Unbreakable Kimmy Schdmidt continues to take the show to interesting places with a serious effort to develop secondary character arcs as well. But if you only watch one episode, it has got to to be the one where "Lemonading" becomes a thing that we need in our lives. Thus the season gets 4 crazy stories of Titus' time on the cruise out of a possible 5.